For years, cancer experts have realized that cancerous cells behave in certain ways like stem cells, unspecialized cells that when exposed to certain signals, can "differentiate." When a stem cell differentiates, it starts down a one-way path that will result in its specialization and eventually its death. For instance, a stem cell in the breast can become a luminal cell, one of the breast's "milk factories." Such cells have a limited life span. Cancer cells resemble stem cells not because they can turn into other cell types, but because in developmental terms, they seem to go in the opposite direction: they begin to run through multiple layers of stop signs and barricades and just keep on multiplying. When the researchers genetically removed or chemically inhibited the protein, called BPTF, stem cells could no longer maintain their "renewing" state and began to take on the character of specialized breast cells—and then soon died. "That was very exciting for us," says dos Santos, "because that's exactly what we want to drive breast cancer cells to do. We want to take away their stem cell-like qualities—especially their ability to multiply indefinitely. We are testing the idea that a drug that inhibits BPTF might have the same effect in cancer cells as in stem cells—it could cause them to differentiate and then die." 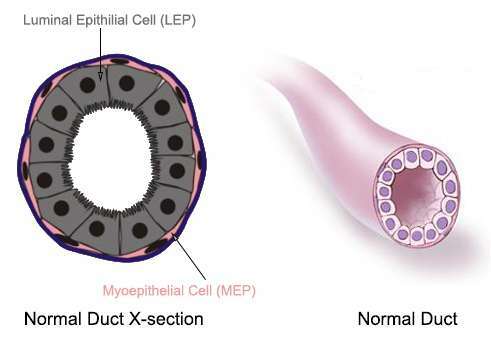 As the illustration below indicates, the hollow "tube" that forms the milk duct is built from luminal cells; these are surrounded by a thin layer of cells called myoepithelial cells. Receptors on the surface of the myoepithelial cells are designed to interact with a hormone, oxytocin, released during lactation. This interaction causes the myoepithelial cells—on the outer layer of the ductal structure—to contract, squeezing the luminal cells within. Those luminal cells are the breast's milk factories. With so much DNA squished into such a small space, it stands to reason that expressing a gene in the "middle" of the bundle might require loosening the packing material to expose that segment of DNA to the machinery that copies it into an RNA molecule. This copying is the first step in using the gene's "blueprint" to manufacture a needed protein. Chemical modifications to chromatin—and even more specifically, to the histone proteins that provide "spools" around which the DNA is wound—are called epigenetic modifications. "It has become very clear that the opening up or tightening of chromatin, to expose or hide genes in our chromosomes, plays a role in cancer progression," dos Santos says. "For instance, exposing a gene at a particular moment might help a cancer cell bypass a 'stop sign' in a growth pathway." The research published today shows that BPTF is part of a regulatory system that opens chromatin and changes gene expression, specifically in mammary stem cells. This opening of the chromatin turns out to be critical in the ability of the stem cell to remain "immortal"—to give rise to daughter stem cells that will also help maintain a tissue such as the breast, and seeding it, at different times of life, with specialized cells. For example, during puberty, when the breast develops, or during pregnancy, when the breast gears up to produce milk. "We now know that mammary stem cells are highly dependent on BPTF. The next task is to explore if can we use that dependency to target stem cell-like programs in breast cancer cells," dos Santos says. The research discussed here was supported by CSHL Cancer Center Support Grants 5P30CA045508 and 5P30CA045508-28; P01 award #2P01CA013106; the Sidney Kimmel Cancer Foundation; the Pershing Square Innovator Award; the Rita Allen Scholar Award; the V Foundation Scholar Award; and the Manhasset Coalition Against Breast Cancer Award. "BPTF maintains chromatin accessibility and the self-renewal capacity of mammary gland stem cells" appears online June 1, 2017 in Stem Cell Reports. The authors are: Wesley D. Frey Anisha Chaudhry Priscila F. Slepicka, Adam M. Ouellette, Steven E. Kirberger, William C. K. Pomerantz, Gregory J. Hannon and Camila O. dos Santos. More information: "BPTF maintains chromatin accessibility and the self-renewal capacity of mammary gland stem cells" Stem Cell Reports, 2017.